Get ready for the full WWII experience! Men of War: Assault Squad 2 War Chest Edition brings you all the classic real-time strategy action of the award-winning Men of War series in a single package which includes all available DLCs. Enjoy the original bestselling Men of War RTS in the remake called Assault Squad 2: Men of War Origins. 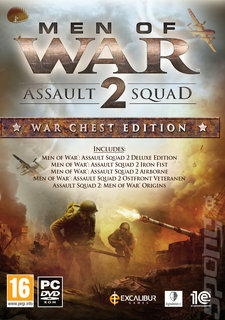 War Chest Edition includes Men of War: Assault Squad 2, Assault Squad 2 Deluxe Edition, Airborne, Veteranen, Iron Fist and the remarkable remake Assault Squad 2 Origins. Assault Squad 2 features single-player skirmish modes that take you from extreme tank combat to deadly sniper stealth missions. Face off against opponents on various multiplayer 1v1 - 4v4 maps and bring battles to life with the 8v8 game mode designed for huge battles on the most spectacular maps.